What: The public is invited to a groundbreaking ceremony for the new South County Justice Center in Porterville for the Superior Court of Tulare County, marking the start of construction of this long-awaited project. When: Thursday, February 23, 2012, from 1:30 to 3:30 p.m.
Where: National Guard Armory, 29 North Plano Street, Porterville, California. Public parking is available adjacent to the armory, with additional parking available off Plano Street north of the armory. The ceremony will begin at the armory, followed by the groundbreaking at the new courthouse site adjacent to the armory. Who: The ceremony will include remarks by Presiding Judge Melinda Myrle Reed, Judge Glade F. Roper, and Court Executive Officer LaRayne Cleek of the Superior Court of Tulare County; Porterville Mayor Ronald L. Irish; and Mr. Mike Ennis, Tulare County Board of Supervisors. Why: The event celebrates the culmination of more than five years of planning and design for the new nine-courtroom, 96,000-square-foot courthouse to replace the current overcrowded Porterville Courthouse. Scheduled for completion in fall 2013, the new courthouse will provide the necessary space for expansion and enhanced security, enabling the court to greatly improve access and services. 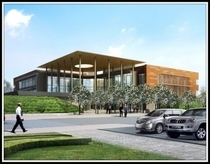 For more information, including architectural renderings of the new courthouse, is available online. Members of the public needing accommodation due to a disability, such as an assistive listening system or a sign language interpreter, are requested to contact Ms. LaRayne Cleek at 559-730-5000, ext. 1110, at least 72 hours in advance of the event. Members of the media wishing to attend the ceremony may contact Ms. LaRayne Cleek at 559-730-5000, ext. 1110, for directions, parking information, and other background information.